Emma Corlett, Unison steward at the NSFT, said: “The figures match what we have seen on the ground. “There are a number of factors that have impacted on staff, including significant loss of resources and the reorganisation of services. “The consequences of that was people applying for their own jobs and in some cases colleagues were competing for the same job having worked together for 20 years. Discounts at gyms? 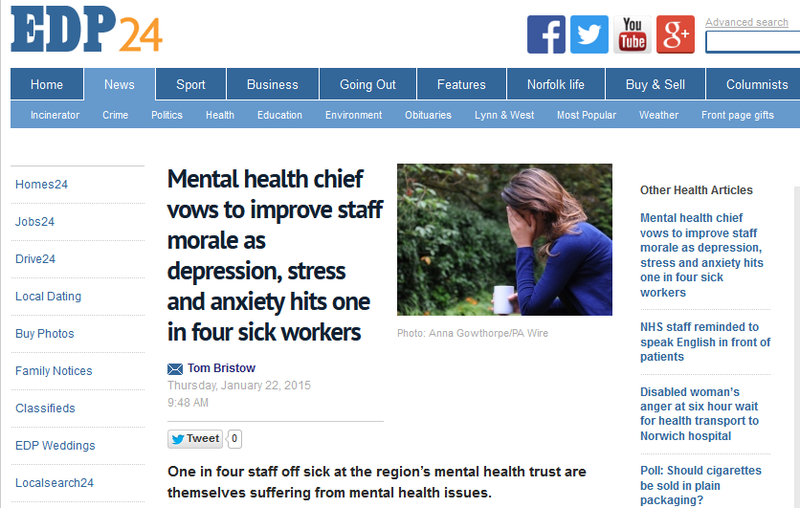 I am sure the staff are too stressed and tired after doing a shift at NSFT. Morale would improve if their workload is reduced to a safe and legal level. Oh, but due to the radical redesign, long term therapy cuts, AO cuts, etc etc….more people are being re referred back into the service. You’ve brought this upon yourself NSFT. The people that truly suffer are the staff and clients, whilst management sit on their hands. What precisely did they expect to happen? – It is the callous disregard for people and their wellbeing that is central to the entire NSFT debacle. This is meant to be an organisation dedicated to promoting positive self regard and good coping mechanisms. Why then slice the service down to a level where it is in disarray and marginalise the staff to the point they no longer feel empowered or valued. A very good description of affairs. As a new member of staff and a former service user myself, I have experienced the service from both angles. As a service user 5 years ago, things seemed ok and I considered my brief treatment to be a success (as my turnaround from service user to staff member would suggest)… yet this was treatment at low risk level. I think services for moderate to acute have been stretched for a long time. To be fair, the current problems are simply linked to the event many staff do not even want to talk about (the ‘radical reshuffle’), but the new teams and structure seem to working far better and light would appear to be at the end of the tunnel. The introduction of ‘peer support workers’ who have ‘lived experience’ are now working with teams and offering the face to face ‘recovery focussed’ work and time with service users that other staff have been too stretch to fulfil. My hopes for the future with this new structure are generally very high. I do have confidence that this should alleviate some of the stresses of the job for all parties. …Not in the forgotten / side-lined Older People’s Services it won’t. I’ve got a radical solution. Give staff the resources to EFFECTIVELY help service users, including adequate staffing levels…..that will reduce workloads and therefore stress far more than ‘discounted gym memberships’. Professional and personally the ongoing defacement of the service in norfolk and suffolk brings into sharp focus how those responsible show such profound distain for the people who actually have been left to cope with the mess they created in what simply comes down to a frantic arsecovering exercise. They do not care for people needing their service, they do not care for their staff. They care for their own positions, and even if they were removed en mass, they would simply get a nice big pay off and start again doing the same thing somewhere else. They should be held personally liable for their crass and asinine decisions. Sacking is too good for them. If they were nurses they would be struck off and never be allowed in a position where they could do such damage to others again. Let’s not forget that stress depresses the immune system, making physical illnesses more likely, so the 25% of ALL sickness due to stress is likely to be much higher. Stress is much worse when you feel utterly powerless to change things; I would urge staff to join a union and get involved in buiding its strength. Also join our Campaign. We meet every month to organize activities. The next meeting is on 3/2/15 at 6.30pm at the Vauxhall Centre, Norwich. All welcome. Hello, I was just looking around and went across this thread. I was diagnosed to have severe depression 3 years ago and tried almost everything out there that “could” help. The only medication that worked best for me is medical cannabis. I perfectly understand that it’s not legal everywhere. At first, I was doubtful so I started doing my own research and read articles about marijuana. I found out that each marijuana strain has different uses for different diseases. Like this strain https://www.gyo.green/free-marijuana-seeds This one is very effective when it comes to stress and anxiety. Just sharing, have a nice day to all.